On Tuesday night I went to the first (annual?) Utah Game Wars. It was an event for local game developers to get funding to further their projects. Out of I believe a total of 12 submissions for consideration, 8 finalists made it to the evening to showcase their games to judges first, then to any member of the public who registered for the event. The devs submitted their works as either developed (published on any kind of platform, available to the public) or undeveloped (not yet released anywhere), and the public got to cast their vote for a people’s choice award. Developed games could win $10k, undeveloped $15k, and an extra $500 to the crowd favorite. I didn’t research any of the games before showing up, nor did I read the print and eat the free food that was provided, so it was off to a rocky start when I showed up around 7pm. As I perused the room and listened to developers explaining their projects to people, I was . . . surprised. There was an educational game, a sports stock exchange website, a isometric high fantasy regurgitation for tablets, and other equally equally forgettable games. I was excited to go to the evening because I thought I’d get to see the next Super Meat Boy or maybe something really radical like Hotline Miami or something. Instead, it was all safe, tame, and not very enticing to the stereotypical indie gamer. Thankfully, the developed game category winner (and people’s choice winner) Tripleslash Studios pulled through and made the whole night worth it for me. Back in the corner of the layout was Magnetic By Nature, developed by a handful of University of Utah students who make up Tripleslash. After a successful Kickstarted seeded them $10k, Magnetic By Nature: Awakening was released on the Xbox Live Indie Games. For 80 credits, I can tell you its a steal. Here was the only game at the event that was by gamers for gamers. 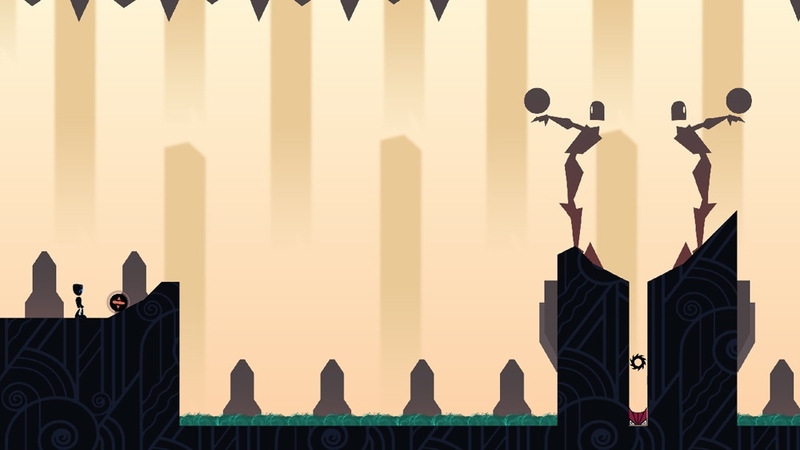 You control a robot in a 2D side-scrolling environment. As the title suggests, your magnetic body traverses the art deco inspired background and a darkened foreground (ala Limbo) by attracting to different magnetically poled spheres. In a word, the whole look is incredibly charming. 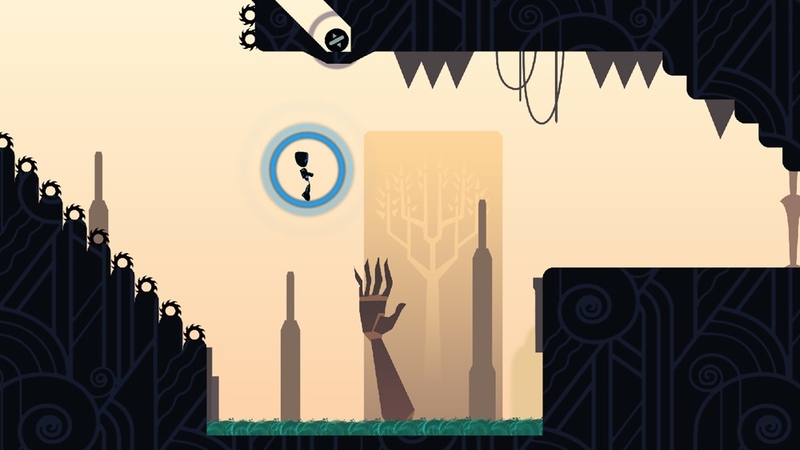 Although the foreground reminds all of Limbo, the lively backgrounds and obstacles you run by brighten up the gameplay and make the world fun to go through. I didn’t get a chance to oust a small child off of the demo machine and try the game myself, nor have I purchased the game on the Xbox Live Arcade yet (yet being the operative word . . . I want to buy this game, and I will), but the gameplay seemed to be three primary buttons – jump, attract to a blue magnetic pole, attract to a red magnetic pole, and of course, the analog stick to run forward or backward. Like all great puzzle games, the complexity comes layered into the finesse with which you can navigate spinning sawblades and swirling seas that threaten to end your life, not in the gameplay mechanics. And if the description and screencaps don’t convince you enough to give this game a shot, then the amiability of the developers should. I chatted at length to two of the gentlemen on the team and they were very willing to answer my questions, hypothesize about the future, and reminisce about the beginning. I was pleased to hear that they have ideas for more games in the future and would love to keep pushing into the industry with their studio, Tripleslash. First priority though, fattening up Magnetic By Nature though. The developers excitement and enthusiasm was infectious as they started talking about sprucing up the artwork and adding more mechanics (one dream mechanic was being able to throw your head and then attract your body to it to get through levels). I’ve talked about this before but it’s the same every time I get to interact with Good Guy Greg developers – I just want good, nice people to succeed, 100% of the time. Tripleslash Studios are good people, and their victory (including the people’s choice) at the Utah Game Wars just warmed all four chambers of my heart. I hope to watch their meteoric rise with this project and all their future endeavors. The official website doesn’t work right now but I’ve been assured the Facebook page is a good way to get a hold of the developers if you’re interested. You can also follow their updates on their official twitter account, @TeamTripleslash.